The CR Way 4 Longer Life Software provides unparalleled capabilities to manage your diet and lifestyle for optimal health and longevity. This is much more than just a calorie tracker. It downloads to your home computer - making it easy to apply the latest scientific research to achieve your goals. Purchase the product separately or become a Brain Booster or Personal Consultation Member, so the software will be included in your benefits. In days of old, artisans crafted fine pottery or perhaps a Stradivarius violin or even the ceiling of a chapel called “Sistine.” These days artisans often express their creativity through electronic media, and we were lucky to find a pair of them: Ed Prestwood and his partner, Robyn Freeman, of CyberSoft. Years ago, CyberSoft developed NutriBase, the best nutrition and fitness software on the planet, and they just keep refining it. If you question this superlative description, log on to NutriBase.com and see for yourself. There you can find a comparison between NutriBase and the competition, something that no other software manufacturer dares to do. We were first motivated to purchase NutriBase for our own dietary tracking needs. When you strive for optimal health as we do, knowing the details of what you eat is essential. So we searched and searched and eventually found NutriBase, a stand-out from all the others. What distinguishes NutriBase is its creator, Ed Prestwood, and his desire to seek perfection. For example, when we needed software for advanced tracking of the first human CR study, which we launched with Metametrix Clinical Laboratory – we asked Ed to develop a nutrient-density function. This allowed the nutrient content per calorie of various foods to be compared. Ed loved the challenge, created the function, and now makes it a regular part of his advanced products. When it came time to develop a CR Way-branded software, NutriBase was the natural choice for a partner. 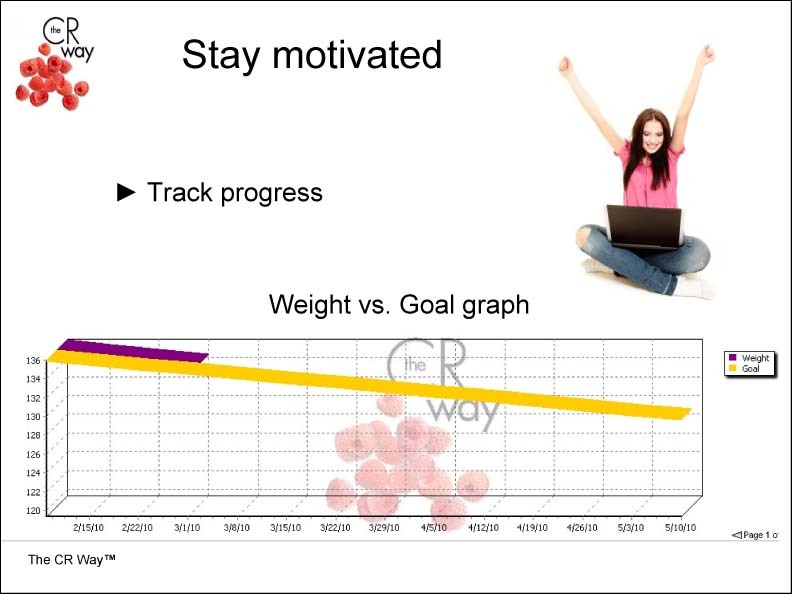 We needed innovative ways for CR Way enthusiasts to track their glucose, heart health, CR Way benchmarks, and so many other important new ways to support and enhance CR biochemistry that are now practiced by thousands of CR Way followers. Whether the goal is to lose, gain, or maintain weight – the software’s “calories in, calories out” function is invaluable. Starting with total calorie intake and calorie expenditure for exercise and other daily activities, the software’s charting function automatically generates calories-burned data, so you can adjust your intake and exercise accordingly. Perhaps our favorite function is the “Holy Grail” tracking capabilities of glucose levels – correlating circulating blood glucose with carbohydrates and with exercise, two variables that are vital to controlling glucose levels. Not only is keeping glucose low important for preventing diabetes, high glucose is linked to increased risk for cardiovascular disease, cancer, and Alzheimer’s disease. We call the glucose control marker the Holy Grail, because lower glucose levels activate AMPK (Adenosine Monophosphate Protein Kinase), a master metabolic regulator that becomes active when glucose levels are low and calories are limited. AMPK switches off growth-driving chemistries that accelerate aging, while making cells stronger – more energy efficient and better able to survive. What if you prefer to use CRON-O-Meter, Nutrition Data or other dietary tracking software? No problem! Just let us know and we will deduct the price of the CR Way 4 Longer Longer Software from the cost of your membership. 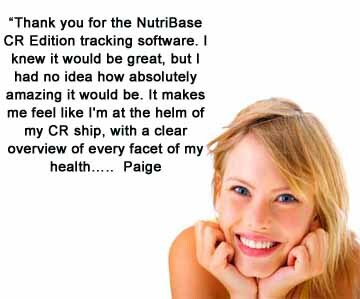 Join the NutriBase CR Way Edition Software Forum. This version of the CR Way 4 Longer Life software is for personal use. Call us if you need the Professional Version.